This article gives you a hands on approach to migrating an application written in Java using Eclipse for Android, to Windows Phone 7 using Visual Studio, C# and Silverlight. You’ll take a look at a complete Android application, and see how to migrate its user interface and code over to Windows Phone 7. You’ll see how you can use the Interoperability Bridge from Microsoft to assist in API translation. The application is a fun little tool that takes a look at stock price history and uses technical analytics on a stock to determine if now is a good time to buy it, or a good time to sell it. Please note that this is just a demonstration, and you should not base your investment decisions upon it. It takes a look at the stock price history over the last 2 months, and calculates what are called ‘Bollinger Bands’ for the stock. These provide an indicator for the statistically relevant values for the stock. An indicator that it might be a good opportunity to buy the stock, because its price is relatively low, comes when the stock is at the bottom of the bands. Similarly if its price is relatively high, it will be at the top of the band. The app will allow you to type in a stock ticker, and calculate the band. It will then convert the current price of the stock into a position within that band, with 0 being at the bottom and 100 at the top. It will use this to drive a slider in the UI to show you the relative position of the price. So, for example, Figure 1 shows the calculation for AAPL on November 14, 2011, running in the Android 2.3.3 Virtual device. It bases its calculation on the closing price of the day before. For Apple, this was $384.62. Today, as I run the application, the stock is trading for $379.77, showing that the methodology is quite accurate! Has an XML-defined user interface, within Main.xml. Uses code to initialize some parts of the UI, for example, defaulting the status slider to ‘50’, as well as using code to dynamically update the UI, changing the value of the slider once the analytic is complete. Uses the network stack to consume information over the internet, and requires the manifest to provide permissions to allow this. Uses pure Java for the math involved in calculating the data. Regardless of what your app is or does, most apps will have some of each of these pieces of functionality, so, if you can port this app, you are well on the way to being able to port any app! At this point, I’ll assume that you already have Eclipse, the Android SDKs and everything else you need for Android development. If you don’t, please go visit the Android Developer portal and get yourself set up. We’ll be looking at Eclipse with the StckPckr application a little later on. For Windows Phone development, you can use Visual Studio Professional, if you already have it, or, if not, the free Visual Studio 2010 Express for Windows Phone does the job nicely. You can download this from Microsoft using the link. There aren’t a lot of major differences between the free and professional versions of Visual Studio if you are just getting started, so don’t worry if you just want to use the free one. The main difference you may see when following through this article when using Visual Studio Express is that there are less application templates available to you. To get started, once you’ve installed Visual Studio, launch it, and from the File Menu, select ‘New Project’. You should see the list of template types. Select ‘Silverlight for Windows Phone’ on the left and ‘Windows Phone Application’ from the list of available types of available types. See Figure 2. Give your application the name ‘StckPckr7’ and press OK. 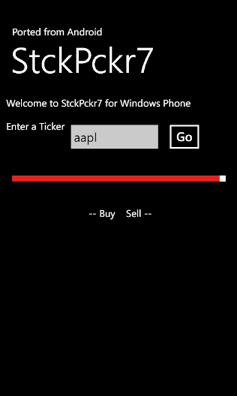 Pick Windows Phone 7.1 as your target OS and press OK. 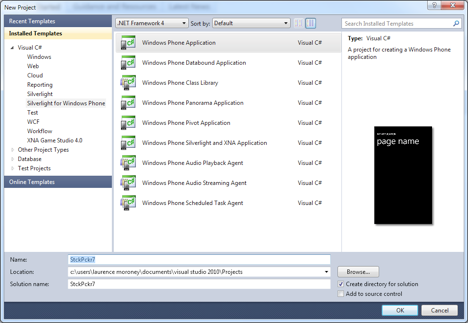 Visual Studio will create a new Windows Phone 7 project for you and load the user interface into the designer. It will give you the visual representation of your UI and the XML markup defining it side by side. Microsoft calls UI XML Markup ‘XAML’, which stands for XML Application Markup Language. See Figure 3. As an Android developer using Eclipse, you’ll be used to having to configure multiple AVM’s based on the different OS or device types that you target, from Android 2.1 phones all the way up to Android 4.0 tablets. As there is relatively little variance in Windows phones, the emulation experience doesn’t require such configuration. Simply press the Run button (or F5) to launch your app within the emulator as you can see in Figure 4. Great, now you have everything you need to get started. So let’s switch back to Eclipse and take a look at the Android application. The best place to start will be with the XML that defines the UI for the StckPckr application, and migrating that over to XAML. In Eclipse, within your app/res/layout folder, you’ll see a file called ‘Main.xml’. Open it up and you’ll probably see it in the visual designer, like Figure 5. 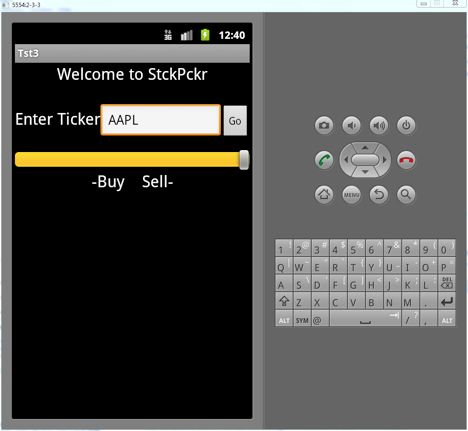 The first LinearLayout is the root of the view, and it contains 4 controls: The TextView that says ‘Welcome to StckPckr’; a LinearLayout control which contains a number of controls in its own right; a seek bar; and another text view. These controls are laid out vertically. The LinearLayout called ‘linearLayout1’ is a child of the first, but it is oriented horizontal, and it contains a TextView, an EditText field and a Button. Each of these controls has a corresponding control in Windows Phone 7, and a great way to find out what they are is to use the API Mapping Tool provided by Microsoft. A quick search of the API mapper shows that for many Android controls Gravity maps to Alignment. A neat part of intellisense in Visual Studio isn’t that it is triggered by matching the characters you type to the first part of the property – it instead does it to any part of the property. So, if, for example, you are editing a TextBlock, and you type ‘Align’, you’ll see ‘TextAlignment’ shows up as an available property, and this is what you’ll use to do centering of text the way gravity does it in Android. The highlighted part is where you will draw your UI. The rest is the UI that is provided for you by the OS, but you should edit the TextBlock controls that specify ‘My Application’ and ‘page name’ to something a little friendlier. This will give you a UI very similar to the Android one. Press F5 to launch it in the emulator. You’ll see something like Figure 6. Obviously this is not a very pretty UI, but it shows how you can get started with the porting. By tweaking the properties, or by using Expression Blend as a WYSIWYG tool you can make the UI much nicer. But for the sake of brevity, we’re going to leave it this way visually for the rest of this article. You don’t need to name all the controls, just the ones that you want to address in code. You’ll see how to do that in the next section. Where, in this case, the view is defined using Main.xml. The code for a Windows Phone 7 view is a little more tightly bound with its view definition. Typically, if you have a view called MainPage.xaml, you’ll write the code for it in MainPage.xaml.cs. If you look at the Solution explorer for your project you’ll see this. See Figure 7. So now you can write your code within this class, and it will handle the UI defined in MainPage.xaml. In an Android application, you’ll typically do any code-based initialization of your UI in the onCreate function. This function gets called as your application is creating the view, but before it renders it. Thus, you want to put code in there that initializes your UI components (such as setting the Seekbar Maximum and current points), so that they are ready before they are drawn. Here’s the full code for the onCreate in our app. If you look up Activity.onCreateView using the API Mapping tool you’ll be shown that the equivalent in Windows Phone 7 is called Application_Launching. This is true, but not entirely true. Application_Launching fires before your Application loads and renders its UI. But if your UI has a class underpinning it, a better way to manage the initialization of that class would be to do it in the constructor of that class. That way the UI objects can be ‘local’ variables, instead of the ‘global’ ones that they would have to be if you were addressing them from a global class. It’s better object-oriented programming that way. For reference though, you should explore the Application lifecycle events. They are stubbed out for you in Visual Studio in App.xaml and App.xaml.cs. Similarly, we can reference the Button directly by its name, but we still need to add an event handler for it. If you’ve never used Visual Studio before, follow the next steps carefully to see one of the cooler auto complete features. Open up MainPage.xaml.cs and put the cursor in the constructor function. Type ‘bt’, and you’ll see a menu appear with Btn1 in it. It recognizes that you have this object. Hit the TAB key, and it will be filled out for you. Type a dot ‘.’, and then the letters ‘C’, ‘L’ and ‘I’. You’ll see that the menu follows your typing, and by now ‘Click’ will be at the top of the list. Hit TAB again to fill it out. You can use try..catch() in C# exactly the same way you use it in Java. I’ve just omitted it here because it isn’t necessary in the C# version of the analyzeText function which you’ll see next. So, thus far you’ve seen how first to migrate your UI, defined in XML, to a XAML based one. Then you saw how XAML and C# work together to provide a code-behind for the View, in a similar manner to a Java activity. You then saw some of the application lifecycle, how to run code upon starting up the view. Finally you saw how to reference UI controls from within your code, and ‘wire-up’ event handlers so that you can write code that responds to events in the application. Finally we’ll look at meat of the Java app, namely the code that gets the user’s input, retrieves data from the web, analyzes it, and uses this analysis to provide feedback to the user. It find’s today’s date, and converts that into day, month and year values, and then the date 2 months ago, doing the same, and inserting these into a StringBuilder that builds the URI. 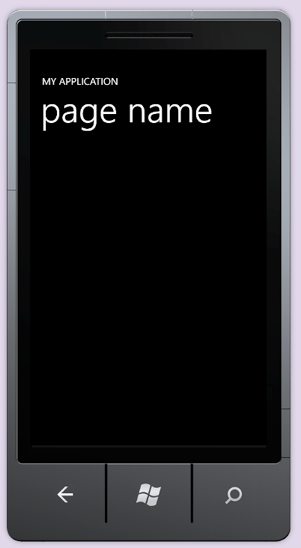 While Windows Phone 7 has a ‘Calendar’ object, it’s actually a UI control that represents a calendar. So don’t get thrown off by this! In C# the equivalent to the Java Calendar is the DateTime class. The next step is that the Java Android code creates an HttpClient object to manage the connection to the service, an HttpGet object to represent the action that will be taken on that service (an HTTP request is typically a POST or a GET, and in this case it’s a GET), and an HttpResponse object to execute the command on the client and read the response. With the code-insert provided by the TAB key when typing the second line, I had an event handler function created for me. So, in this case once the phone reads the data from the URI, it will call back to that function, thus not locking up any threads. The final step is to analyze the data, by calculating the Bollinger Bands, figuring out their envelope, and then figuring out where the current price lies in this envelope, as a percentage figure, with bottom being 0% and top being 100%. Explaining the statistical analysis behind this is beyond the scope of this article, but in a nutshell, the average over the range is calculated, and then the standard deviation is calculated from that. The top band is the average + 2 standard deviations, the bottom is the average – 2 standard deviations. Here is where Java and C# are very similar, and you’ll see from the code that only minor tweaks were needed – mostly because the C# program uses a List<Double> instead of the array list, so it’s API is a little different, and because it doesn’t require casting to get variables in or out. So now, if I run the Windows Phone 7 version of the application, and type AAPL as I did with the Android one, I get the same results. See Figure 8. 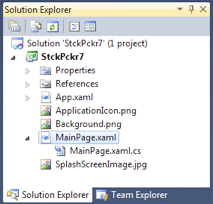 In this article you saw how to port an Android application from Java in Eclipse to Windows Phone 7 using Visual Studio. You learned about the Windows Phone Interoperability Bridges website, and saw how you can use this to understand the Windows paradigms for Java controls and objects. You saw how the XML UI could be moved to XAML, and then explored how the application lifecycle and event wire up worked in Visual Studio. Finally you wrote the code that handled the user input and output, and saw how the application can run on a Windows Phone 7. Laurence Moroney is the owner of netNavi.tv, a software consulting firm based in Seattle that specializes in mobile and cloud computing. He's the author of too many computer books to count, including the popular 'Introducing Silverlight' series, as well as an upcoming book on Windows 8. As well as computer books, he's the author of the popular 'Fourth World' series of Young Adult Novels.